This is our complete guide on how to unlock all the various weapon and tool items for your Palico in Monster Hunter World. Your Palico is going to be right by your side over the tens and hundreds of hours you spend with Monster Hunter World, so it pays to treat them well. 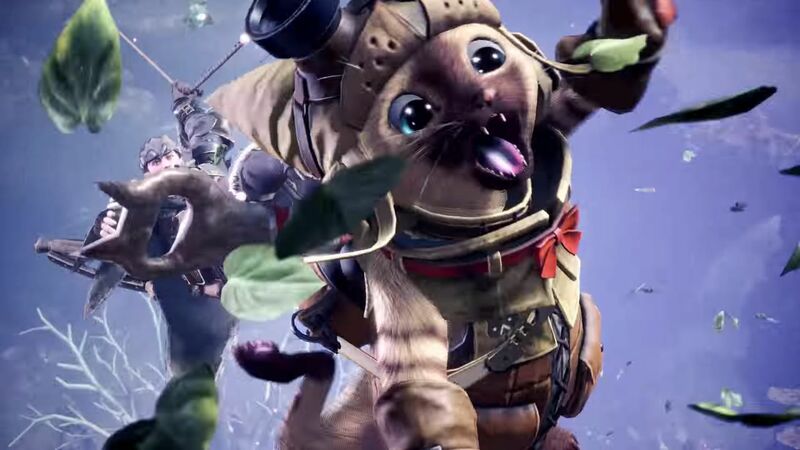 In this Monster Hunter World Palico guide, we'll be walking you through everything you need to know about your furry feline companion in Capcom's game. If you instead needed anything else on the massive game of Monster Hunter World, including how to quickly track down a monster using the Scout Flies, as well as how to use a Shock Trap to capture a monster without fail, make sure to head over to our Monster Hunter World guides walkthrough hub. At the very start of Monster Hunter World you’ll be prompted to create and customise the looks of your Palico from scratch. After this, you’re placed out in the open world of the game when Zorah Magdaros, then a Great Jagras, then an Anjanath attack, before you eventually make it to the hub area of Astera. To visit and interact with your Palico while you’re in Astera, head to the white certain in the side of the ship, just to the left of the area with the Commander, and you’ll find yourself in your own private quarters, which you and your Palico apparently share. Head over and interact with your Palico, and you’ll have the option to change and sell their gear, as well as whether or not you want them to stay in Astera and miss out on the next mission with you (which we don’t recommend). But how do you go about acquiring brand new weapon and armor items for your Palico to use? Every time you successfully defeat a brand new monster for the first time in Monster Hunter World, be it through a main quest or an optional quest, you’ll have the option of crafting the corresponding weapon and armor outfit at the Smithy for your Palico. For example, when you eventually take down the powerful Anjanath as part of the story of MHW, you can then go back to the Smithy and craft the Anja armor and weapon for your Palico. While this system of unlocking new gear for your Palico might sound a lot like how it works for your player character, the gear for your Palico thankfully costs a lot less monster items to craft. 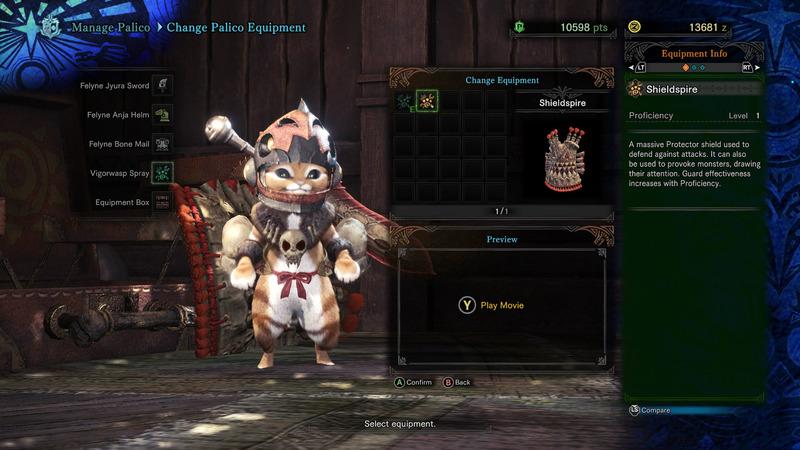 New armor items for your Palico, which comes in two parts of the helmet and body armor, never costs more than two items in total to craft, meaning you can regularly craft brand new armor items the first time you defeat a new beast in Monster Hunter World. Your Palico starts out Monster Hunter World with the basic Vigorwasp Spray in its arsenal, which gives it the ability to bring over a Vigorwasp from the nearby surroundings, and explode it over you in the heat of battle, boosting your health a great deal. To unlock other Palico gadgets for your feline friend to use in Monster Hunter World, you’ll have to find the various Grimalkyne Tribes and help them out. You can find the complete list of our Monster Hunter World Grimalkyne guides just below, where we’ll walk you through how to find the feral Palicoes, and help them out to gain rewards like the Flashfly Cage and Plunderblade. This concludes our complete Palico guide for Monster Hunter World, but continue ahead to our complete weaponry guide, or head over to our full armor guide.